A Year of Being Here: Elizabeth Spires: "Zen Sonnet"
disappear a horse without a rider over a sharp-edged horizon. to the one who walks into this room when we are gone. beggars with empty bowls in straw hats grass sandals. "Zen Sonnet" by Elizabeth Spires, from Southwest Review (Volume 99, Number 3). Text as presented on Poetry Daily (September 1, 2014). 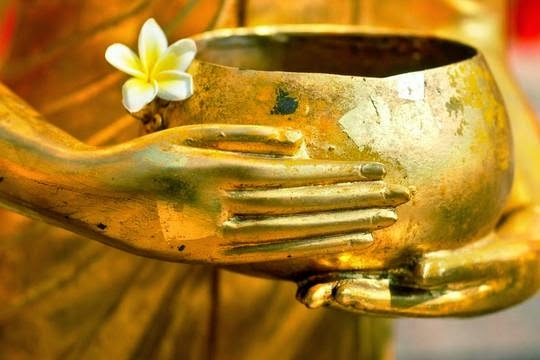 Art credit: "Buddha statue close-up [of] Monk's alms bowl," photograph by Worradirek Muksab. I cherish especially that fourth-to-last line: "abandoning the poems that were never ours though we wrote them"! This is lovely. I've already read it four times and will keep on returning to it. Thank you!